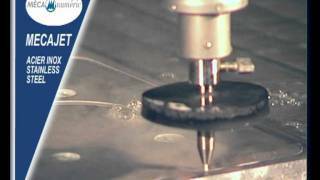 Discover MECAJET the new range of Water Jet equipments conceived by MECANUMERIC, machining and cutting by VHP soft materials, and, with addition of abrasive, hard materials. The cutting table is equipped with a steel welded one-block frame with integrated stainless steel tank (adjustable water level), a two-axes gantry with bellows, guided on both sides by a very high precision rack and pinion system holding one or two cutting head(s). The cutting heads are servo-controlled in height (motorized Z) and equipped with a pneumatic controlled start/stop valve. Guiding is asssured by Brushless motors on X, Y and Z axes. The gantry moving is assured by a synchronised double motorization with positioning control by incremental encoder. The very high pressure water input is done through a set of VHP piping including an extension arm for the mobile part. The material to be cut is set on removable grids holder. The access to the machine is protected by light curtains. Control is done thanks to a numerical control with Human-Machine Interface run under Windows XP. The 3 or 5 axes cutting head(s) are fed by a VHP pump from the worldwide leader KMT (ex INGERSOLLRAND), from 15 Hp (10 kW, maximum flow 1,2 l/mn at 3800 bar) to 125 Hp (92 kW, maximum flow 10 l/mn at 6200 bar). Mecanumeric MECAJET waterjet cutting machine for soft and hard materials.The MECAJET incorporate the latest innovations: controle system on CNC POWER AUTOMATION (CN7100 ISO), new pneumatic cutting heads long lasting, axes positioning control, 3 or 5 axis head, rake control, etc ... The 3 or 5 axes cutting heads are powered by a THP pump ranging from 15 HP (10kW, maximum flow 1,2 l / min at 3800 bar) to 125HP (92kW, maximum flow rate 10 l / min at 6200 bar). This water jet cutting machine is designed for soft materials: rubber, plastic, leather, etc. and hard materials with abrasive addition: metal, ceramic, glass, stone, composite materials, etc.